The Advanced Student's Book gives learners an immediate sense of purpose and clear learning objectives. It provides core grammar and vocabulary input alongside a mix of skills. Speaking lessons offer a unique combination of functional language, pronunciation and conversation skills, alongside video filmed in the real world. Each unit ends with a consolidation of core language from the unit and focuses on writing within the context of a highly communicative mixed-skills lesson. This version of the Student's Book does not provide access to the video, assessment package and online workbook. A version with full access is available separately. Cambridge English Empower is a general adult course that combines course content from Cambridge University Press with validated assessment from the experts at Cambridge English Language Assessment. The Advanced Student's Book gives learners an immediate sense of purpose and clear learning objectives. It provides core grammar and vocabulary input alongside a mix of skills. Speaking lessons offer a unique combination of functional language, pronunciation and conversation skills, alongside video filmed in the real world. Each unit ends with a consolidation of core language from the unit and focuses on writing within the context of a highly communicative mixed-skills lesson. This version of the Student's Book does not provide access to the video, assessment package and online workbook. A version with full access is available separately. 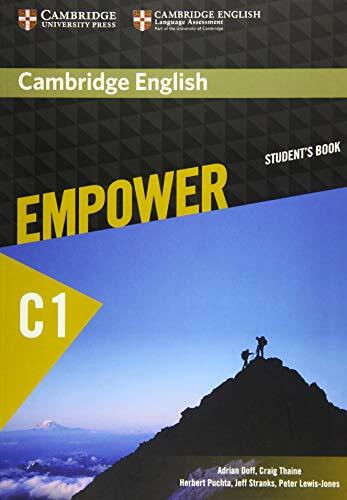 Cambridge English Empower is more than just a course book - it's a complete solution for effective learning and teaching! This new general English course for adult and young adult learners combines course content from Cambridge University Press with validated assessment from the experts at Cambridge English Language Assessment. Empower's unique mix of engaging classroom materials and reliable assessment, with personalised online practice, enables learners to make consistent and measurable progress.